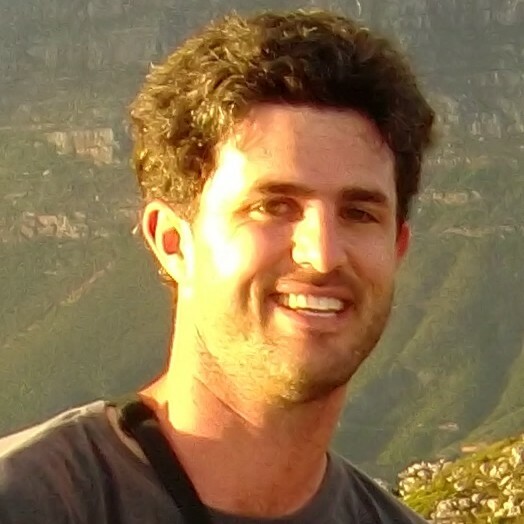 This post is a verbatim transcription of a diary I wrote during a family excursion to a number of landmarks around Zimbabwe. This, the second of two, records our trip to the southwest of the country taking in the Victoria Falls, Mlibizi and Lake Kariba. I was 13 at the time, in my first year of high school in Harare. The other individuals present on the trip were my parents, Lou and Ray; my grandparents, Mutty (pronounced Moo-tee) and Raph; my brothers Daniel (11) and Ivan (8); and a family friend, Pat. The brothers posing by a sign of the Falls. 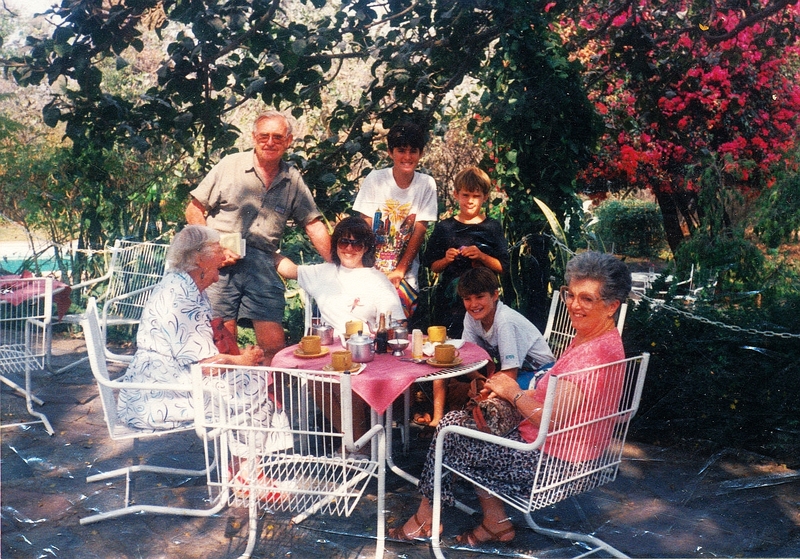 When some three hours later we arrived at the Vic Falls we all readily unpacked and sat down for a cup of tea. What remained of the daylight hours was spent on a quick visit to the Falls, (the) Devil’s Cataract to be precise. Sure enough water to full [sic] the pool back home any day. Arrived back home (Sprayview) for the longest dinner wait I had ever endured and when the food did arrive the embarrassed waiter received the biggest round of applause anyone could wish for. So that explained why the next day was spent in the Wimpy. Miraculously the day finished peacefully. [missing text] After grub we returned to the mighty Falls for a two hour walk. Each stop gave a vantage point to some spot on the Falls, thousands of tonnes of shear water turned to a churning broth beneath the beauty of rock and plant. The water vapour clung to our garments as we crossed through the luscious rainforest and gazed from the cliff heights upon the Horseshoe Falls. But time was scarce and we had to depart from the beauty of the falls and return to Sprayview. After returning for a brief swim we went and prepared for our Daboola Cruise (Note: a popular tour-operated evening ‘booze cruise’). Half an hour later we were chugging out from the jetty on our colonial boat along with Tullany [Tulane] our guide. Seated comfortably in our chairs we were provided with snacks, cool drinks, wine and beer (I managed to get half a glass). Raph silhouetted against the setting sun, Vic Falls evening cruise. 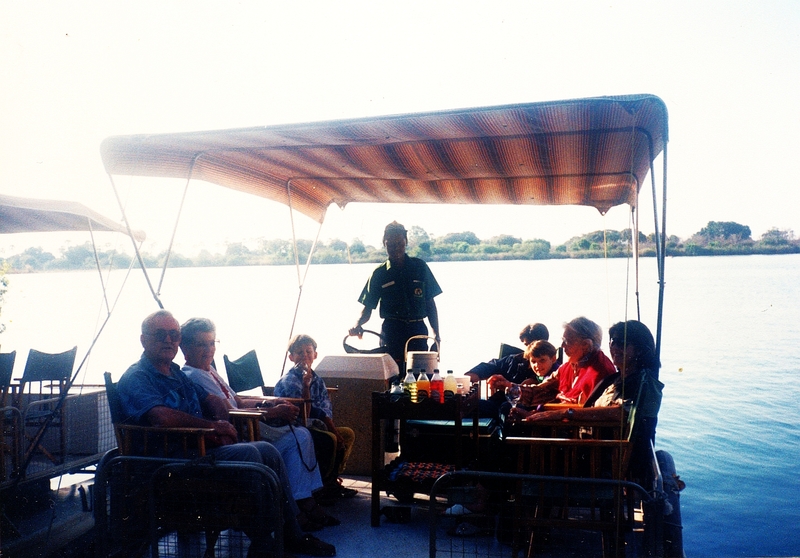 The unforgettable Tullany with the good-natured smile brought us close to hippo, elephant, crocs and many birds. 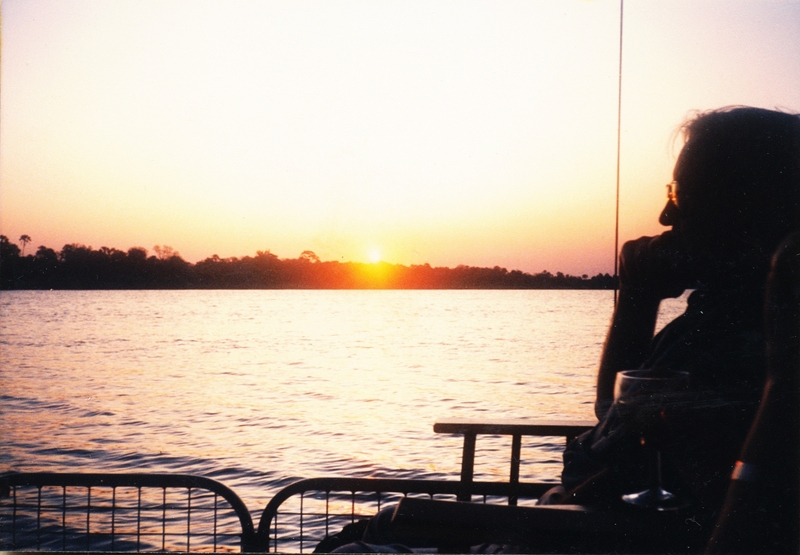 Under a setting sun we saw the lovely Zambezi and all its surroundings in full splendour. On return we heard the hippos grunting us goodnight across the placid waters, a lovely ending to the day. Supper at the Wimpy was followed by a well slept night. 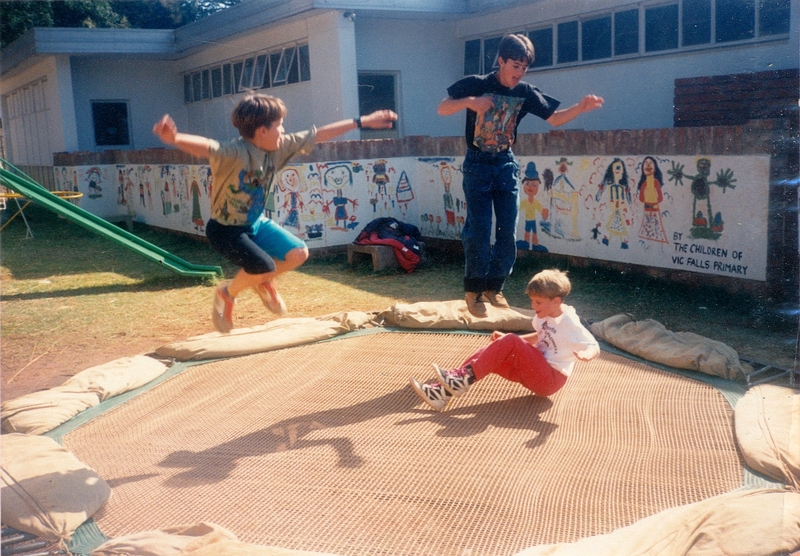 A decent trampoline was a prerequisite. Even after my mosquito-filled night I arose fairly fresh and after a large breakfast and exercising jump on the tramp [trampoline] I was prepared for the journey. 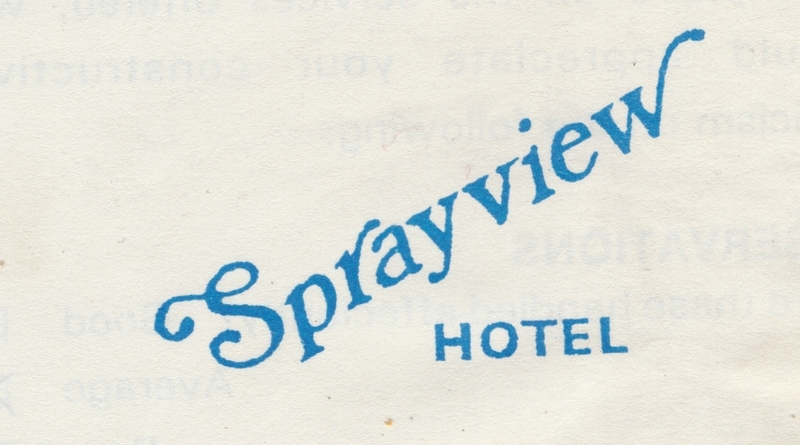 It was no shock to leave Sprayview Hotel because of our inefficient service, although the accommodation was very satisfactory. After leaving and taking a quick look around the classy yet unattractive Elephant Hills Hotel we set forth upon our journey to Mlibizi about 3.5 hours away. Mum and Pat pose in front of a statue of the infamous David Livingstone. 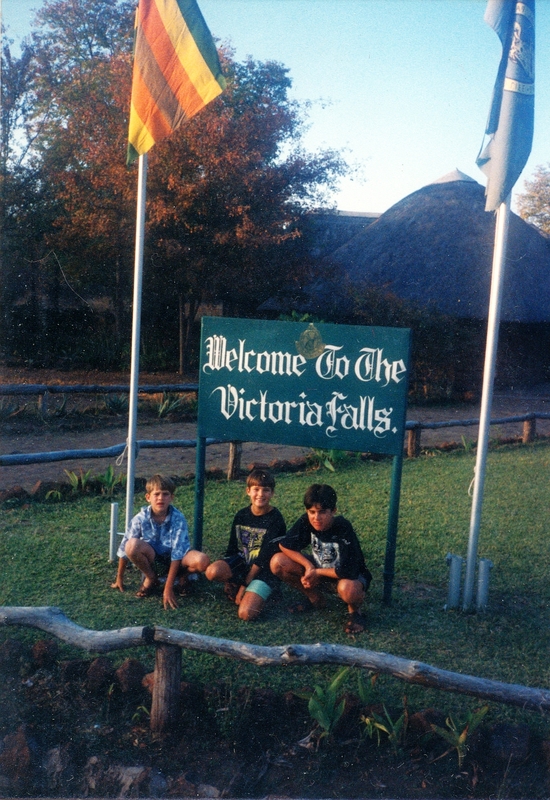 Vic Falls. The brothers, Ray and Pat. Vic Falls. Dan and Ivan contemplate the awfully sheer drop to the floor of the gorge below. No barriers here. Mum, Dan and I at the Falls. Mum at one of the magnificent viewing points at the Falls. Spencer’s Creek Crocodile Ranch brochure. Ivan very chuffed to be holding a prehistoric reptile with incredibly sharp teeth. Mind those fingers! Every place has its eccentricities. At the Victoria Falls it was this beaming fellow covered in all manner of badges and flags. Dan brandished a baby crocodile. Almost a full compliment (minus Dan). Up and fishing at 7:30 along with a quick cup of tea. If I didn’t know better I would say these fish were trained in dissecting the worms from the hooks (the poor worms never benefit). Returned hungry for cereal and toast and a look at the birds attracted by the luscious feeding tray. Drew a little and then fished a while longer although it was the wrong time of day. The land cruiser we went game-viewing in. Lunch that avi [afternoon] consisted of rolls and cold meat followed by a great game of scrabble by the pool in which all the pieces were used. After cooling down the four boys (men) went down for the main fish of the day. Worms were frequently disappearing as usual but this tie we caught six fairly small fish. We threw back out four chessa and two Cornish Jack [types of freshwater fish native to the Zambezi] and hoped for something bigger in future. On return we had showers followed by dinner and an evening of poker. I literally thrashed the lot of ’em until on the last round I tried to be clever and wasted my chips (match sticks). Got to bed where I landed up wirting my diary. Well, was writing my diary – Good Night. Ivan and the old girls. Rose up at 7:30, had tea and then went and booked our boat. After eating breakfast the three of us went to out chalet to acquire our promised 250 worms. No not 250, but near enough to be called a fairly good deal on our part. Well at 11:00 we all set off on our raft [really more of a pontoon] with our guide Sampson (all but Mutty who felt a bit ill). Well it must have been a combination of the wrong time of day, wrong time of year and wrong fishing spot because we didn’t catch a thing. On the way out though things got rather exciting passing dozens of hippos and when Dan and I entangled our lines in the propeller of the boat the hippos surfaced all around the raft. Ray thought the tangle the funniest thing during the trip but luckily the pen-knife did the trick. After a medium sized lunch we all rested and swam till late afternoon. At that time we decided to go fishing which may have been a successful event had Ivan not attempted to throw Dan the box of worms – you can guess the rest. The disheartened fishermen returned and went through the usual process before dinner. After devouring a large meal we hung around telling ghost stories until turning in for bed. 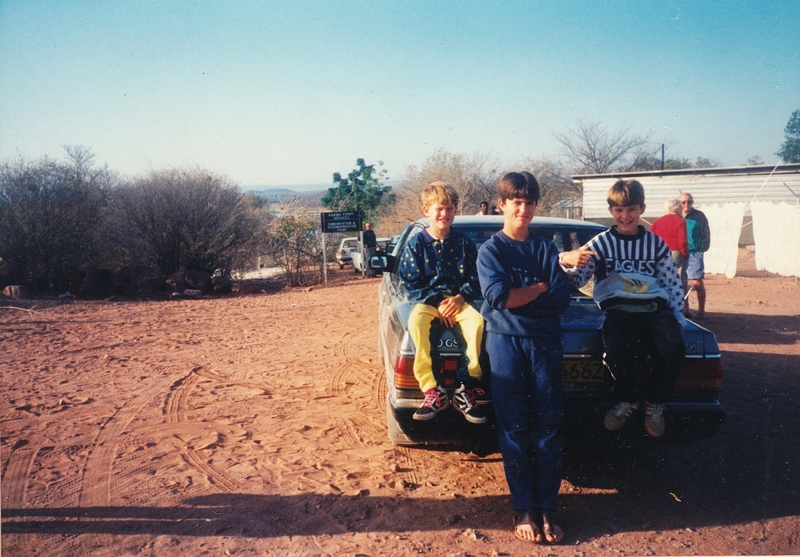 Brothers posing on back of the Toyota Cressida. the river had widened considerably into the beginning of the lake itself, Kariba. The ferry had its car compartment below, the deck in front set upon with tables and behind the lounge, sleeping and eating quarters. 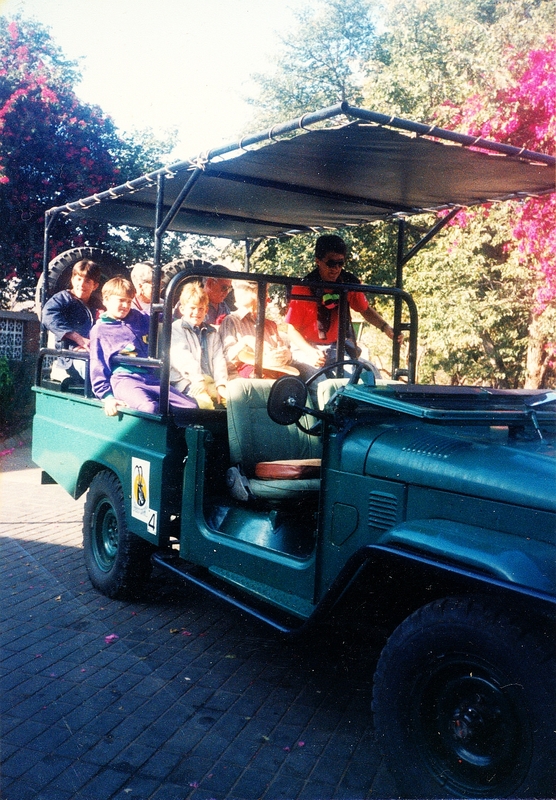 Most of the time was spent outside in the cool, warm air, viewing with the other passengers the elephant and buck. After a lunch of rolls and other things we all lay back until the sunset over the Zambezi Hills had faded and nigh had befell [sic] us. After a healthy supper of fish, chicken, lasagna and salad most people turned in for an early night sleep. Pat, Dan and I all decided to sleep outside along with another ten on deck. Because of the lack of mattresses, Dan and I had to use the chair cushions, but all seemed to be comfortable enough on top of that (for the time being that is). 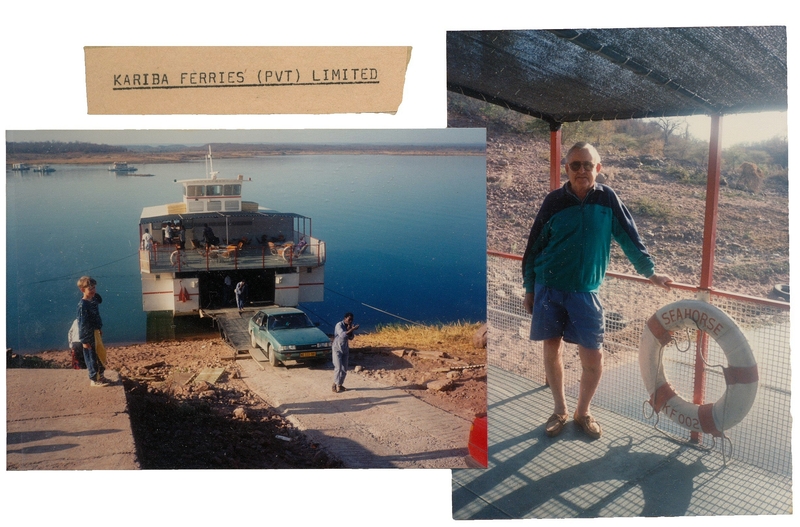 L: Disembarking from the overnight ferry, Kariba harbour. R: Raph shows off his wonky left leg. Not long he had a replacement knee inserted. Waking up to a setting sun is different to waking up to that of a rising sun so I knew I hadn’t slept in. This surprised me though, thinking back on the night’s events. I could remember waking up at 2:30 to a howling wind that whipped up the blankets and numbed out faces. Luckily we managed to get another blanket that partly protected us for the rest of the night. Ivan looks particularly happy. I think it’s because of the top he’s wearing. After a quick breakfast, mainly of scrambled egg we actually arrived at Kariba (the town). We then removed our car and wandered aimlessly around town for a while before finding the shops where we stocked up on milk. We then went to the Cutty Sark Hotel, had tea, played table tennis and relaxed. 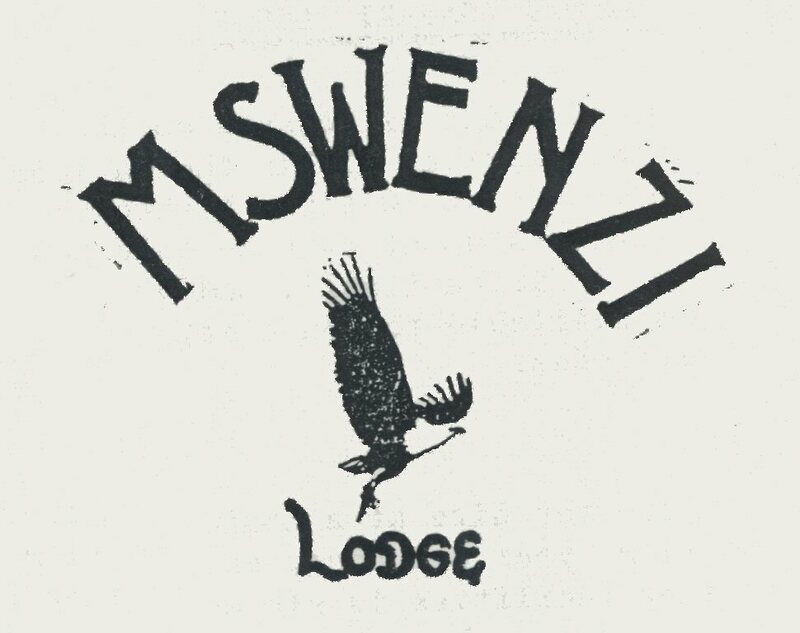 After tea we continued to our lodge at the Nzou Camp [Mswenzi Lodge]. We got in early and quickly investigated the three-roomed lodge with the spacious lounge adjacent to the dining room. 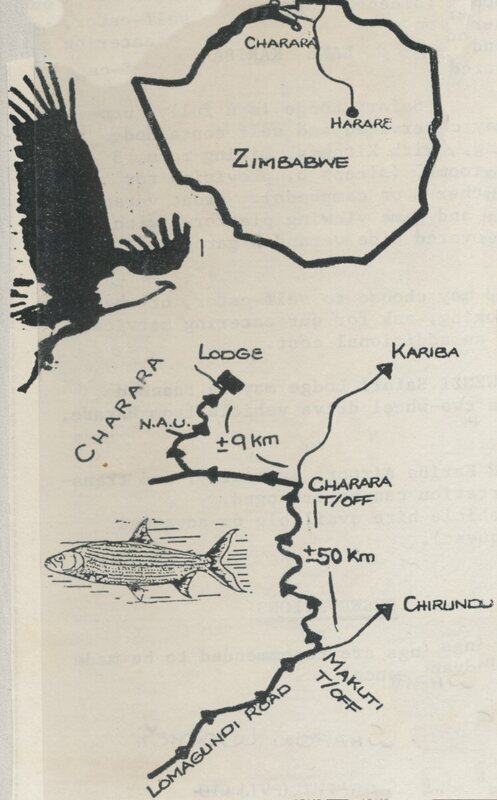 Route map to Mswenzi Lodge. It was ll very pleasant with the thatching…[? ]…veranda and the ame viewing/sun-bathing platform. After settling in and having lunch Dan, Ivan, mum and I went down to the pool (Ray came later). After waiting patiently for some petty [pretty?] girls to depart from the pool we eagerly dived into the cool, refreshing waters. Mum, like all women, waited for the Barbarians (Dan and Ivan) to get out and make way for her. It didn’t turn out like that, though. As soon as she had got in the two of them bombed [her] and rapidly wet what was her unwet head. Ray then turned up and after his brief swim we all returned. Blog note: On re-reading this I was slightly shocked at what appears to be an offhand sexist remark on how women apparently behave in swimming pools. I suppose I can only attribute it to my limited world view at that age! That evening we all browsed [casually sat in this context] around watching the impala and waterbuck before having showers. We all gathered together again afterwards for a supper which consisted of rice and salad. Supper for me was followed by bed. 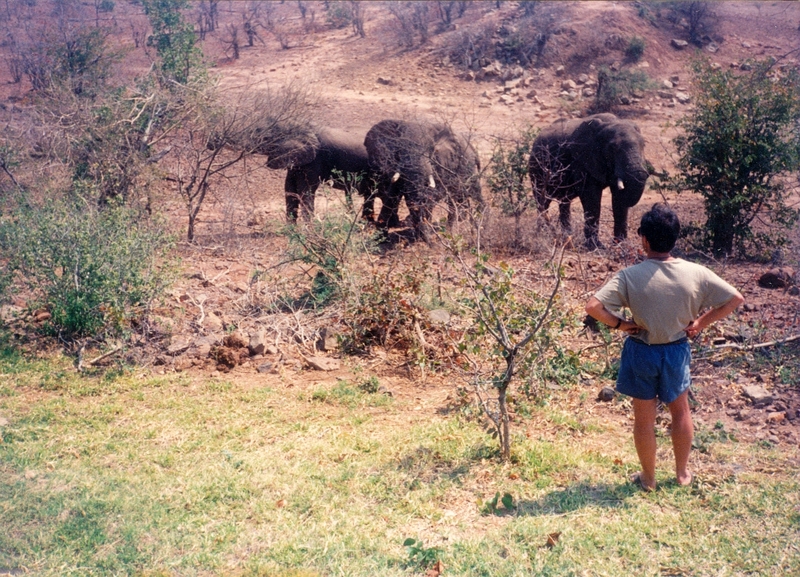 Ray goe out to have a word with the elephants. They agreed not to defecate on the loge walls thereafter. Mum woke me up just after six for a walk with Pat and her. We all got dressed and just before setting out Dan decided to come as well. After walking down to the pan where we saw zebra, impala and waterbuck we headed onto the lake bank to view most of the birds. Well the Blacksmith Plover really did set off the alarm after carrying on his call for at least 10 minutes. Then, while coming on out way back through the grass we nearly trampled four side-striped jackal in their small lair. They were quick to get away and probably returned after we had gone. After returning and having breakfast the family and I set off to Cutty Sark for our worms. After that we carried on to Caribbea Bay. At the Bay we all needed a swim so we managed to slip into the resident’s pool. After the cool swim we walked over to the Supatube but that wasn’t free though (it was 50c er ride!). The tube was short but went at hell of a speed so it wasn’t long before all our goes were gone (16 each). When people enjoy themselves time seems to fly by like today – the time was already 1:00 [pm]. Lunch at home consisted of tuna sandwiches and salad. After lunch we didn’t do much until 4 o’clock, the usual fishing time. Well, after 1 and a half hours the result wasn’t worth telling so I won’t (it’s the fish not the fishermen). After going back at sundown and helping cook the fishless braai we all ate a hearty meal. After the meal Raph and I conquered the others in a game of scrabble (we really came second). Now, though, it’s time for bed. (Phew, my pen’s running out and my pathetic mother nicked some paper for the laundry list). Hope you don’t notice the change. 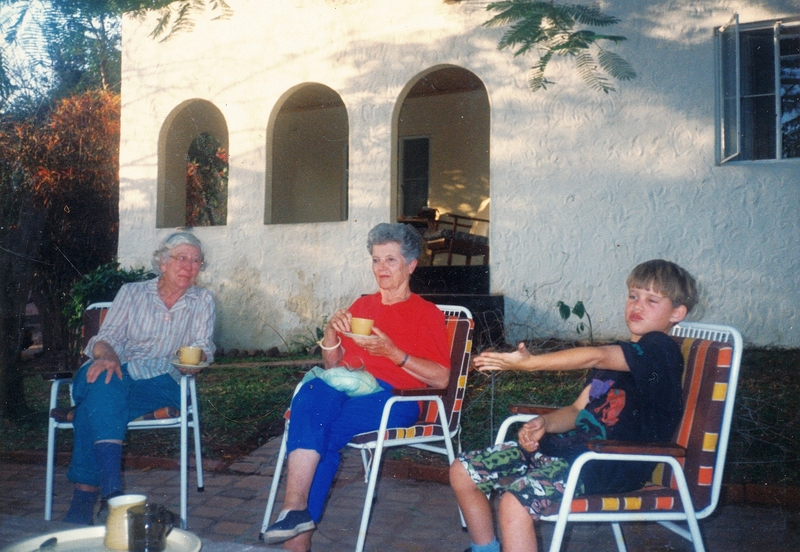 Blog note: Apologies to my late mum. Our veranda at the Lodge. The three of us excluding Dan went for our morning walk as usual although we now decided to cut through the grass straight to the lake bank near the pans and follow it to the boat jetty at Nzou. We saw no zebra but the impala, waterbuck and birds were abundant. And as a bonus on the way back we saw three handsome bushbuck. It is amazing how one gets so hot so early in the morning but that was the way it was so we were all pretty pooped for breakfast. 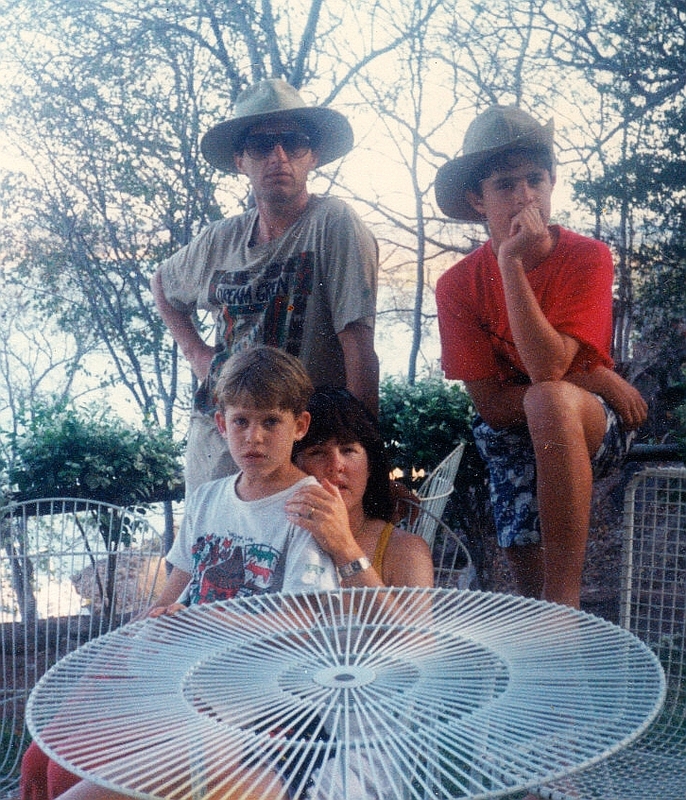 After breakfast the family and me went for a major fishing trip. Although (as usual) we caught nil, with our worms and mussells [sic] we had some pretty big bites and the guy next to us caught a barbel. We returned late and spent the hot afternoon lazing around sluggishly. Then at 4:30 we all went down for a final effort at the jetty until six – caught nothing (boo hoo! Better luck next time). We got back for supper with an old friend of PAt’s who spent much of her life in the bush with her dog. Well I would have liked to hear some of her incredible stories but before long I had drifted away into the land of dreams. Contemplating the enormity of Lake Kariba’s arched concrete wall. 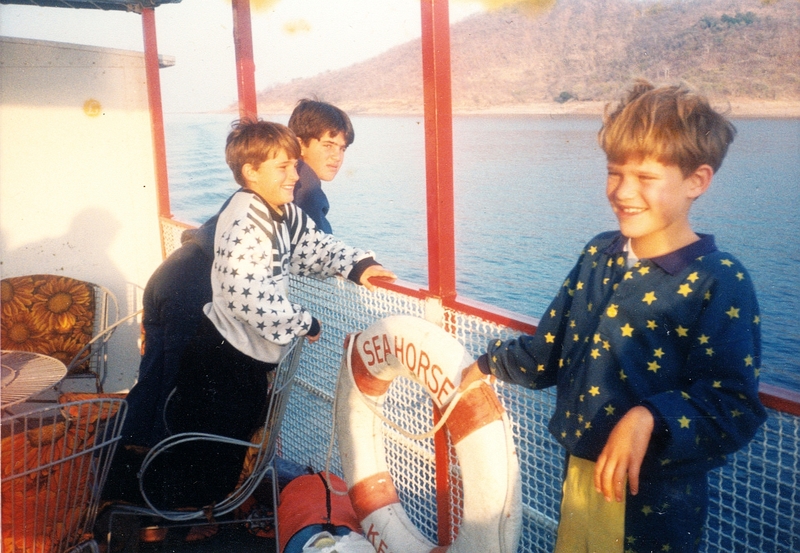 The brothers, Kariba Dam Wall. My final day’s breakfast was forcefully put down because of the oranges that curdled the milk. Packing didn’t take long and after bidding farewell to faithful old Zuze the housekeeper we set out for home. At first we travelled far up the winding slopes of the hills but before long we were back on the even plateau on the way to Chinhoyi. The caves there were amazing except they were needing a clean, but all the same the deep, tranquil sleeping pool was an awful site [sic] [an attempt at humour?!]. 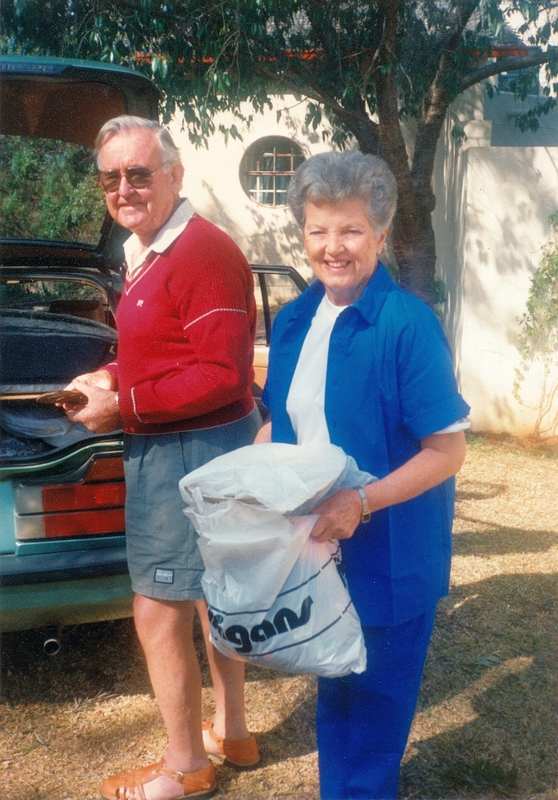 After the caves we had lunch and then continued to Pat’s house in Harare to say bye to her. Pat was greeted happily by Isaac [domestic employee] and her dog Taurus and when we returned the same [welcome] from Trymore, Edmore and the dogs. What an end to a super holiday. 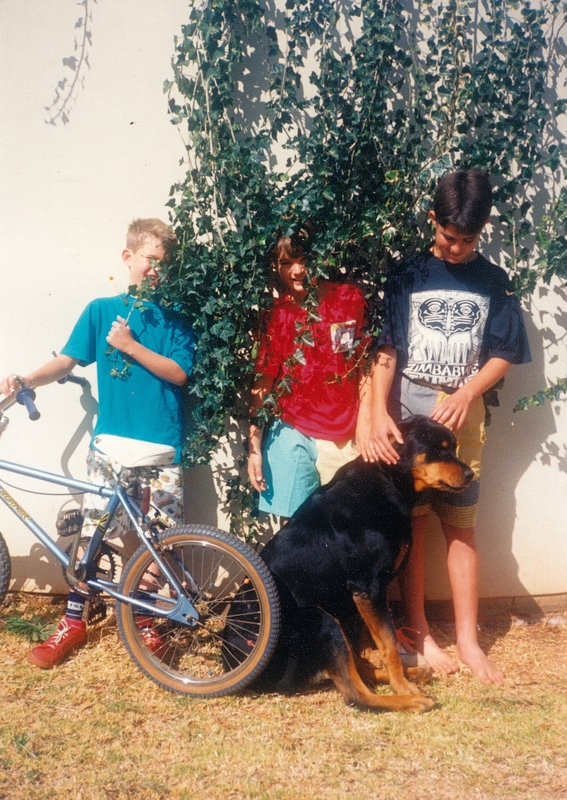 The brothers and out bashful Rottweiler, Tina. Blog note: I have a very clear recollection of Taurus, a sturdy Staffordshire Bull Terrier, leaping at me at full tilt as I stepped out the car. Fortunately it was joy not aggression that motivated him. Our domestic workers were all related and my brother Dan still employs Trymore and his wife 20 years later.